I thought I would write up some information and provide photos and samples of the cool new photo frame I received on Thursday (January 12, 2006). 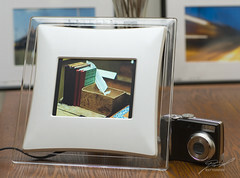 The eStarling Photo Frame is a WiFi enabled, 5.6 inch stand-alone photo viewer. It seems to be available only through Think Geek (who no longer reports any inventory on the eStarling). It must be configured from a Windows 2000 or XP machine (bummer). While you can load images into the frame through the Windows machine, it is only needed to configure the WiFi settings before the frame can run on its own. Overall its a very cool device. The eStarling has only two ports (power and USB) which are located on the right side. It also sports an arm that rotates with detents at each of the 90° positions. The unit has seven buttons for user control across the top edge. The function names and icons are printed on the transparent frame above each button. To the right of the buttons is the slot for SD or MM cards. Images may be pre-loaded onto these cards and they will be added into the slide show along with anything held in the internal memory. The individual images loaded (either directly or through the WiFI connection) into the eStarling Photo Frame can be displayed in a filmstrip view of 6 images across the bottom of the screen. The selected image is shown above the film strip. The eStarling currently has four speeds for the slide show – no automatic advance, 3, 6, or 10 seconds. Currently the eStarling has no transition options, but the company is planning a firmware version to make those available in the future. The "Teacher's Desk" image was downloaded from Flickr through an RSS feed and is displayed on the screen. The image shows significant distortion which appears to be from compression. To see the source image, visit "Teacher's Desk" on Flickr. The supplied software allows configuration and loading of images either via the USB cable or WiFi. The device supports 802.11b networks with no encryption, or WEP 40/65-bit or 128-bit (but passwords much be entered into the current software in HEQ only). Once the WiFi connection is set -- either static or DHCP addressing -- add in your single POP or gMail account and multiple RSS feeds. You also have the option to load and delete images either in the internal memory or the MM/SD card. The software is basically only what it needs to be, no bells or whistles. This is a very entertaining device right now. I have two Flickr RSS feeds (mine and all of my contacts) assigned to the frame right now. Then I've loaded some of my older, better shots onto an extra 64MB SD card I had laying around the apartment and shoved that in. Its been a great conversation started when we have people over, and when I'm working alone off the laptop it served a stress break. I paid about $270USD delivered through thinkgeek.com and don't regret the purchase. That being said there are a few issues I'd like eStarling to work on in their firmware and PC software (and they have been extremely responsive to my e-mails). The first issue is with the brightness of the LCD. There is currently no control to adjust the brightness and in the living room at night it just screams. They expect to have a firmware release soon to correct that issue. The second issue is with the image quality. This is an issue they'll be looking into, but for now it looks like the compression is trashing the images as they're displayed. How do I get the devise to dsiplay images from a gmail account ? Company web site seems to be down. Ouch! I'm not sure -- I was checking out their website just yesterday and noticed that they didn't seem to have any updates. Unfortunately I hadn't received any response from the last couple of e-mails.